A re-issue of the massive hits from Guadeloupe. 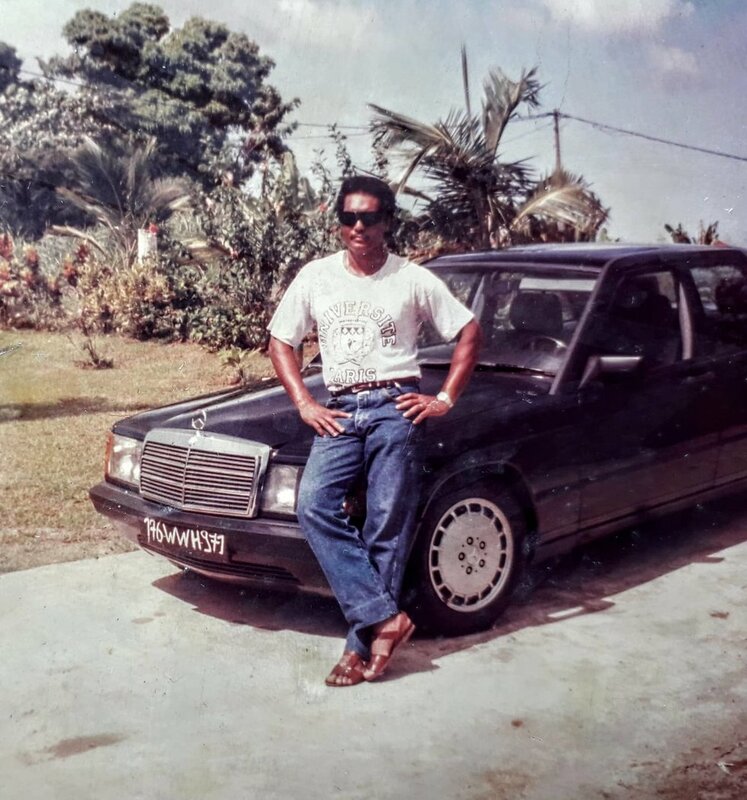 Max Rambhojan's big record, "Tou't Jou Pa Min'm," reached its highest popularity during the 1986 World Cup, when its music video often played during half-time breaks on TV stations in the Caribbean island of Guadeloupe. The highly-infectious song showcased a style known as 'Zouk Chiré,' an energetic and high-tempo version of Zouk music influenced by Guadeloupe's carnival drum bands. Much more than a Zouk artist though, Rambhojan is a known as a master of Gwo-Ka, the Guadelopean folk music (and the names of the hand drums it's played with) which originated during the transatlantic slave trade in the 17th century. Labels Secousse and Hot Mule Records are now reissuing four gems from Max Rambhojan's catalog, which we're premiering here today. Max Rambhojan and his car. Image courtesy of Secousse. "I was born in 1955 at Petit Bourg, Guadeloupe," Max Rambhojan writes to OkayAfrica. "I've been a Gwo-Ka musician all my life, I started as a kid with the legendary Guy Conquête who was hanging out all the time at my grandmother's house to try and seduce my auntie. He's the one who encouraged me to learn music." "Later on I made 2 solo albums in 1985 and 1992 with the help of my friend and bandleader King Klero. This is where those 4 songs come from. In 1986, local TV channel RFO was playing 'Tou't Jou Pa Min'm' on repeat during half time breaks during the Football world cup. That's when I started being taken seriously as an artist. Those songs are still broadcasted to this day all over the French West Indies, and sometimes people tell me they heard them in nightclubs in France too." "I still play the Gwo-Ka most week-ends in Guadeloupe, and I also host a radio show on Media Tropical Guadeloupe, 88.1FM. I hope you enjoy this music!" Max Rambjhojan is available for pre-order and out February 18 from Secousse and Hot Mule Records.